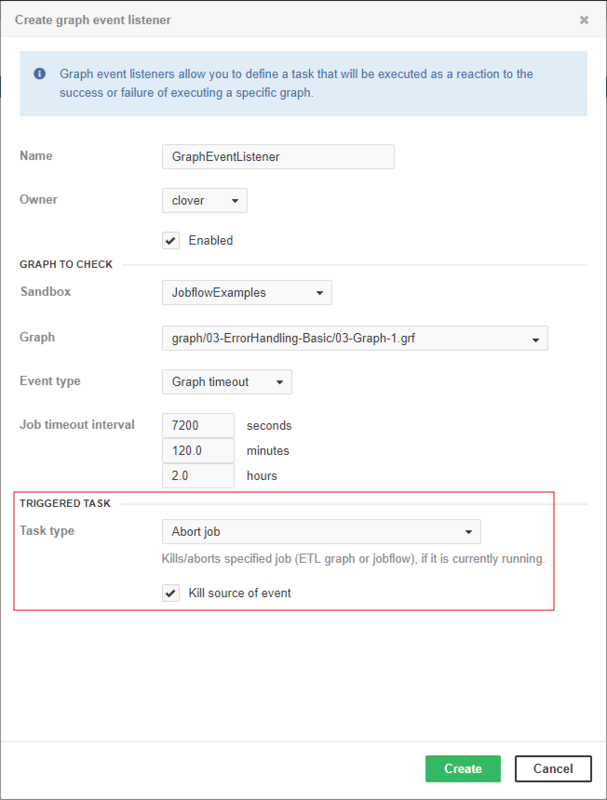 This task kills/aborts a specified job (graph or jobflow), if it is currently running. Node(s) to process the task. This attribute is accessible only in Cluster environment. If there are nodes specified, the task will be processed on the first node which is online and ready. If this switch is on, the task will kill the job which is the source of the event, which activated this task. Attributes sandbox and job are ignored. This checkbox is useful only if Abort job is activated by some event. Select a sandbox which contains the job to kill. This attribute works only when the Kill source of event switch is off. This select box is filled with all jobs accessible in the selected sandbox. All instances of the selected job that are currently running and will be killed. This attribute works only when Kill source of event switch is off. Figure 28.6. Web GUI - "Abort job"